The devastation wrought by Hurricane Katrina can not be overstated. When the levees broke around the city of New Orleans the oncoming water spared nothing in its path. Ray Hepburn knows of this destruction all too well, unfortunately. 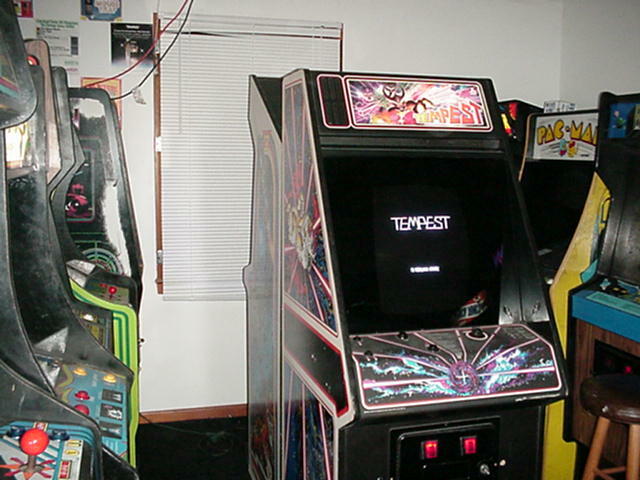 After slowly building and cultivating his collection for years, on that day in 2005 water submerged not only his games, but his entire home in ten feet of water. Everything was ruined. For Hepburn, the decision to press “continue” and rebuild was worth the effort. As an 8-year old in 1980 it was only natural for a boy like Ray Hepburn to gravitate towards arcades. Walking through the doors of bingo halls, restaurants, and game rooms filled with electronic games became routine in his young life. And despite realizing at a young age that this was an element of his life he never wanted to let go, his interest nonetheless waned in high school when getting a job and having a girlfriend became the focus. Still though, according to Ray, the games were a part of him. 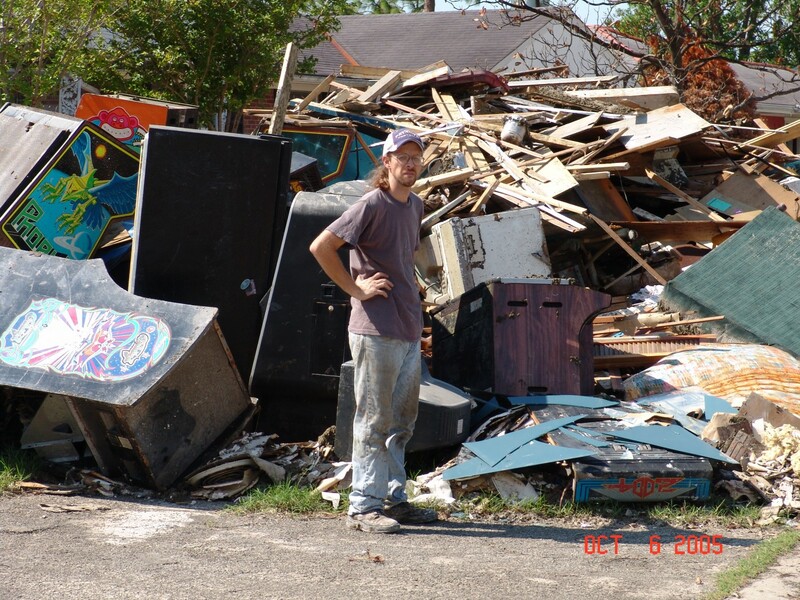 Ray’s original home arcade pre-Katrina. 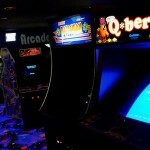 So it was not surprising that one night of reminiscing with a friend in 1990 about the glory days of the arcades rekindled a passion that still burns to this day. One night [my friend and I] broke out a notebook and decided to list every arcade title that we could think of. I got out my old [magazines] Video Games, Electronic Fun, etc. to look up titles. This led to us driving around New Orleans trying to find every game we could to make our list. One day we drove past Lucky Coin Amusement and saw their sign reading ‘Video Games – $195 and up’. We went in and looked around and I saw Crystal Castles and the nostalgia of playing it at the local Chuck E Cheese came flooding back. I bought it on site and had it delivered to my apartment for an extra $35. Though Crystal Castles was his first, it most certainly wasn’t his last. Subsequent pickups over the next three months led to even more games in quick succession: Asteroids Deluxe, Star Wars, and Donkey Kong Jr–all for less than $200 each. Not only did these games fulfill an immediate desire for the memories of his past, but it was a broken monitor not long into his ownership of these cabinets that would also shape his future. With help from his TV-repairman grandfather, Hepburn knew electronics would earn him a living with an added benefit of fueling his hobby for some time to come. 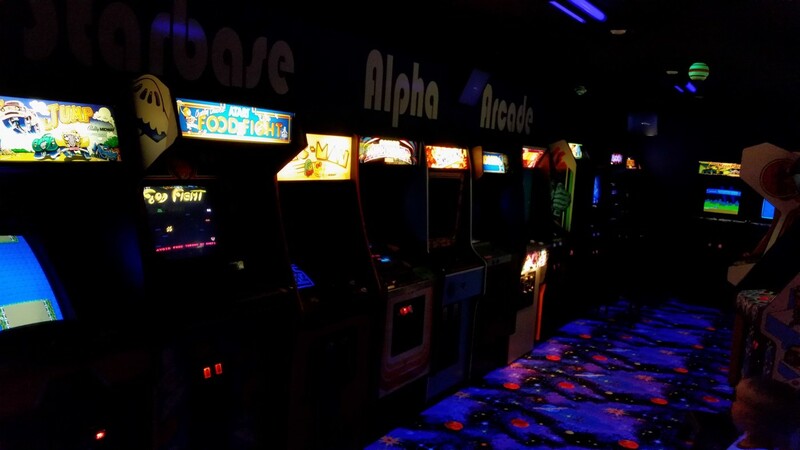 The rebuilt Starbase Alpha Arcade in all her electric glory! Early connections from game pickups would lead Hepburn to his first “warehouse raid,” and his interactions as an electronics tech for an amusement company garnered even more. By 1997, his collection had ballooned to include three warehouses and nearly 200 games. Later that same year, he bought his first home and immediately filled it with games, including fifteen in the master bedroom alone. With so many games to choose from, his home collection was a carefully curated masterpiece, one which he enjoyed for many years until that day in August 2005 when a category 5 hurricane changed everything. The house was a total loss, say nothing of the games inside. The neighborhood too was forever changed. Where some see only hopelessness, others, like Hepburn, see opportunity. 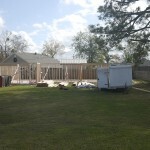 After Katrina hit, the federal government introduced the ‘Road Home’ program, where they would give you grant money to rebuild, or they would buy your destroyed property so that you could move elsewhere. 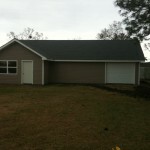 My next door neighbor opted to sell out, and the house next door to his the people kept but appeared not to rebuild, as they had a for sale sign in front of it. Then came the ‘Lot Next Door’ program, where you could buy the lot next door to your home for pennies on the dollar. Of course my wife and I were interested in that, as it would mean expanding our back yard. But then one day my wife said ‘ Wouldn’t it be cool if we could buy that lot and the one next to it that the owners are selling?’ To make a long story short, we bought both lots for around $10K, and expanded our current back yard into both of those properties. 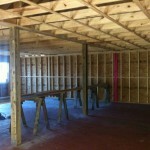 Rebuilding took time, during which Hepburn continued to pay rent on the several warehouses containing his games which were fortunately spared from any flooding. Though he considered selling out numerous times, a new job with an increased salary along with an ever-supportive wife eventually led to an idea to rebuild the arcade not inside their home, but rather on top of the existing slab on their expanded property two doors down. 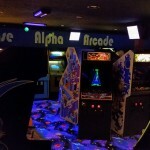 Now two years old, Starbase Alpha Arcade boasts a ground-up construction and a whopping 54 games. 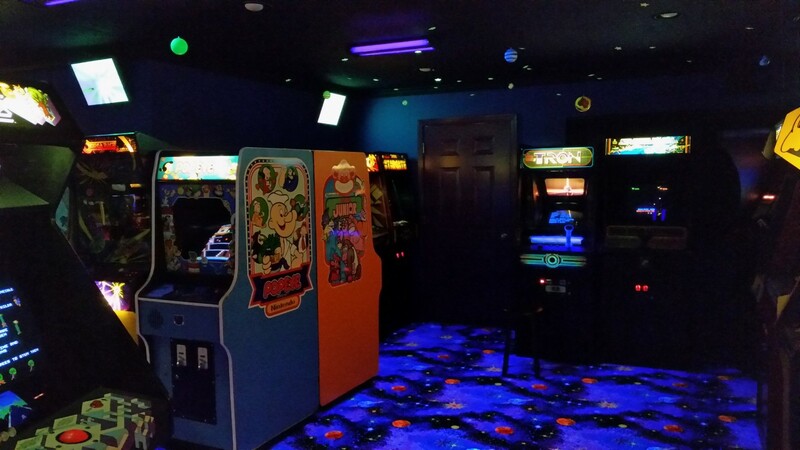 Always going the extra mile, after the initial framing of the structure by a contractor, Hepburn’s wife helped Ray finish the arcade’s interior including insulation, electrical, plumbing, and sheetrock, even her choice of blacklight-reactive carpet. 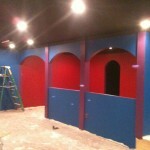 Looking on the bright side of a from-scratch build, a blank slate means customizing the space to the couple’s exact specifications which includes unique archways, interactive LCDs, blacklight fixtures, custom signage, and–of course–games. Putting an end to nearly 20 years of storage fees, Hepburn finally sold off or gave away the remainder of his warehouse stock over the years, but that does not mean he doesn’t still have an eye out for a future Zookeeper or Paperboy. Despite the paring down of his acquisitions, the vast current collection of Starbase Alpha will keep he and his family happy for years to come. Most Friday nights are spent in the arcade as the family eat pizza, watch movies, and play games until late in the evenings. Sometimes the gaming sessions stretch so far that the family sleeps in the arcade. Dreaming under the roof that shelters what he loves, Ray Hepburn can sleep knowing there some some bonds even mother nature can’t destroy. I love what you’ve done with the old games. Marge was an arcade junkie when I met her. Ray: Found your arcade walkthroughs on youtube and love what you’ve done with it. 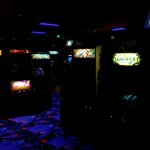 Some of the arcades I’ve seen online seem to forget that it’s as much about the aesthetics as it is about the games. Glad to see you’ve taken that notion to heart. 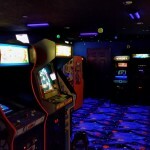 It’s a great arcade with what looks to be a great atmosphere! Preston: Found your podcast on itunes a year ago. Keep up the great work!